I would like to wish all my readers a very prosperous and happy Chinese New Year of the Dog. May the new lunar year sees you fulfilled with all your wishes and aspirations. Like most of my friends, I wasted my teenage years reading torrid romance novels. If a book jacket did not have a buxom woman with long flowing hair being held in the amorous windswept embrace of a bulging bicep-ed male with sculpted six packs, I wasn't interested. There were some food references to be gleaned too, among these pages of predictable, hugely silly and melodramatic stories. 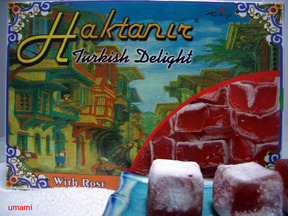 If it wasn't for the sheikh-and-his-1000-concubine-harem I might not learnt about turkish delight and thus might I not known the sensual joys of eating them. So when I saw some sold at Mustafa's the other day I was very excited, ripping open the box as soon as we paid for it. It was not nearly as good as the ones I used to buy from Selfridges food hall, being on the overly sweet side, but the soft chewiness and not too overpowering rose flavour won me over. I promptly went back to the shelf and bought another box to take home. They make great nibbles, particularly apt for watching equally escapist Bollywood movies and Korean soap dramas. 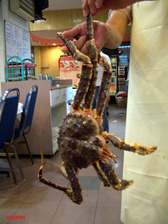 The live Alaskan crab weighed nearly 3 kg. Big monster. Forgot to take picture when the dish came. Here it was at half-time. Absolutely fabulous. Last weekend third sister and Aunt L came down. They came for a three day whirlwind shopping and eating trip. What a coincidence that we were celebrating MIL's birthday too. 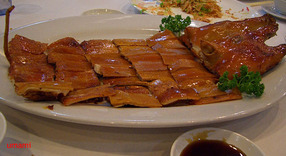 So we all enjoyed another round of Alaskan crab and suckling pig at Chin Huat. But the pictures will have to wait, I still need to copy all the music into my iPod, watch the rented DVD (Korean drama Fashion 70's and Desperate Housewives) by the 26th, quilt, read my blogfeeds, read real books, study French, meet friends, work, sleep, eat pineapple tarts, yoga, shop, pack.....so many things to do in so little time. Well, at least I managed to get my hair trimmed today, nails getting done this Friday. We were walking among the stalls in Chinatown when I noticed that the queue for Lim Chee Guan is not that long, only what, 10 people instead of the usual pre- Chinese New Year line of hundreds. Turned out that the LCG folks have teamed up with DBS credit card for pre-orders so customers can just show up to collect their purchases. Clueless people like us were only too glad to join the short queue. We usually buy after CNY to avoid the endless waiting and exorbitant price hikes. 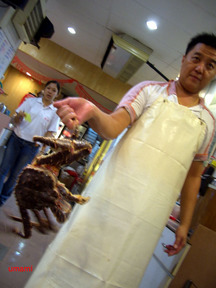 Plus, for some reason or other, the candied meat treat was selling at $35 per kg. Not such a bargain when their next-door competitor Bee Cheng Hiang is selling at the same price. But see, their current price is $44 per kg- for the regular big slices and set to rise in the days leading to Chinese New Year. This evening they happened to be out of the big slices and only the less desirable smaller pieces were available, hence the relative bargain. There was even a man handing out pieces of the small bak kwa, as if anyone really needed to know what it tastes like. Lunch tomorrow: Bak-kwa sandwich, Japanese pears, Japanese sweet corn. A bit on the sweet side but I must add too, very festive! On a softly rainy evening this past Wednesday, 38 people gathered at Peramakan for our first Makan outing of the year. We consumed over 40 bottles of wines and ten courses plus dessert. We had the whole restaurant to ourselves and made a lot of happy noises, there was even impromtu singing. ivan wrote up about this place before, and commented that the spicing was rather light-handed. Our experience was similar. Perhaps we had too many dishes, after a while it became hard to distinguish the various sauces and rempahs, e.g. it was difficult to make out the taste of young jackfruit which was overwhelmed by a thick (but tasty) gravy with a predominant dried shrimps taste. The beef rendang was very disappointing, doubly so because it was expected to be the highlight dish. What came was beef cooked till soft and tasteless, blanketed in a weird red sauce, I venture to guess that the use of a pressure cooker was highly likely. The udang masak nenas was another weak dish, the gravy inexplicably thin and hardly tasting of fresh pineapples. Perhaps too that the restaurant could not cope with mass-producing food for nearly 40 people at a time, some of their regulars present that night assured me that their usual standards are much higher. Nasi ulam: the herbs were finely chopped, even better than what I could manage at home. This means someone really took the trouble, because you cannot use a machine, every leaf has to be cut by hand. The taste was light and zippy with kaffir lime leaves, minus some stronger ingredients like salted fish and belacan which might go into the version I usually make, but very apt here as a first dish to tease and waken the palate. Hati babi bungkus: Not a commonly found dish in Peranakan restaurants, these pork meatballs contain pork liver for an earthy taste. Here the pork was not overly dominated by liver, and I liked the handchopped texture of the meat. The accompanying chilli sauce provided a suitably sharp contrast. Nonya pork ribs braised with taucheo. Salty and beany yet tinged with a pleasant sweetness, together with sambal belacan this dish made me want to eat more rice than I should. Sago Gula Melaka: I was worried that it will be a repeat of Ivan's experience- foamy tetrapak santan that refuses to melt, but no, the owners took note of his comments and made sure ours came with freshly squeezed santan. Real gula melaka that was not too sweet, but caramelly and coconutty as it should be. The sago grains were cooked just right, and the proportions of syrup:santan: sago balanced just so, I had absolutely no complaints here. Apparently we drank far more than what was pictured, some bottles broke and did not make it to the final lineup. Guys we have to be more disciplined next time! The weekend brought one of the longest spells of rains experienced in this little island. And many members of the extended family from Malaysia to celebrate the solemnisation of my cousin's marriage. Just the solemnisation; the wedding banquet will be held later in the year. Our usually quiet apartment played host to the parents, fifth brother, his wife, nephew, niece and their two maids plus baby paraphernalia. Daddy was keen to take his grandson out and see the sights but the miserable weather meant we spent most of his holiday indoors. Two lively, mischiveous kids do not quite make good company to our excitable, territorial dogs. There was much barking and running, and crying and anxious hand-holding and huggings. I love them all, kids and dogs, but they hate each other. At one point the mayhem got quite a bit much and I resorted to plugging my ears with the iPod and sticking my feet in the iSqueez which gave me an excellent excuse for avoiding them all. It was a good thing then that I didn't have to worry much about feeding so many people. On the eve of the wedding my aunt and uncle gathered us all for a noisy four-generation gathering at Ah Yat Seafood Restaurant at the old Turf Club. Gatherings of this size usually only occurs at Chinese New Year so we were very pleased to meet and catch up. My camera card was zapped pretty fast with loads of photos and video shots. The food though was terribly disappointing, the dishes came and went in a forgettable blur of gloopy brown sauces and lashings of MSG, oil and salt. Which meant that after the solemnisation the next day, when uncle again invited us to dinner, we were reluctant to subject ourselves to another heavy dinner, and duly made our excuses. At that point, pizza sounded like a really good idea. But uncle was really insistent, dangling promises of a "big fish" and three suckling pigs to entice us. The thought of fish didn't excite either Mummy or myself, but suckling pig, well, one shouldn't really let that go to waste, no? It turned out that the suckling pig had a tres shiok sambal rub and was roasted to a perfect crackle on the skin and the meat was mostly lean and juicy. Most excellent. The 'big fish' was a live garoupa cut up and beautifully braised in brown sauce with siew yoke and yam, prompting most people to ditch their rice porridge for steamed rice. The big piece of fish tail was tender and very smooth, fifth brother ensured that none was left. 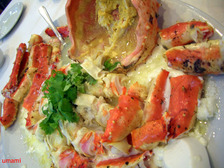 The big surprise of the meal though was the huge Alaskan crabs steamed with huatiao wine and egg white. I've never had Alaskan crab before, sad but true. A marvelous revelation. The shell was soft enough to cut with scissors, the cooked roe golden yellow and wondrously creamy instead of hard, and the flesh, all light and sweetness and deliciously juicily chewy. Much like eating lobsters just out of the sea. I was totally enraptured and wished I brought my camera to capture how big and beautiful it looked. There happened to be three crabs that evening, perfect for our party of three tables. What a good thing it was that our uncle insisted on our attendance. Since then, I've been telling all and sundry about Chin Huat. Curiously, none of my food-loving friends are familiar with it beyond the fact that the owner died unexpectedly last month and his body was not found until days later by one of his dogs. And that it displays huge banners all over Clementi to advertise its low prices on live seafood. Well, I don't know about the prices, but I can vouch for the food, and can't wait to return. I haven't had anything interesting to eat lately, it is back to more sensible foods which are quite tiresome to talk about. In the meantime, I have been busy playing with a "fruit "product of another kind. The new 60GB Apple iPod. It can store 25000 photos! Yes well, it is not news really, but still highly gush-worthy. Even better, I didn't pay for it, someone else did. Thank you thank you. The one really wonderful toy that I bought for myself is this S$19.99 (I paid a little less because I know someone who knows someone) Creative HE-100 headset. I use it to Skype my sister in Guangxi and my friend Cath in Sydney. We are really thrilled and cannot get over how cheap it is to talk to each other. I am delighted with my super-comfy headset which transmits sounds clearly with hardly any interference. I don't even have to wear it on my ear, I just place it on my desk and it picks up all the important sounds like the dogs' bells and husband saying hello from the sofa. What else? Again, because I haven't been out shopping much, I've only just discovered that one can buy DVDs and VCDs of Bollywood songs. Just the songs, not the movies, helps if you've seen the movie, but if, like me, you would like to learn some of the Bollywood dance moves this is perfect. At Mustafa's, of course. Husband has also been uncharacteristically frivolous. We were at Suntec City and there was, like usual, an Osim roadshow. We, like usual, pretended to 'try out' their iSqueez. Only this time, he surprised me and the salesman by actually buying one. He is very sweet, my dear husband.